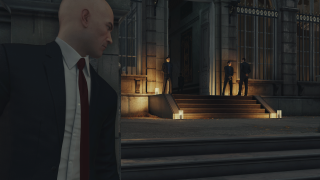 IO Interactive has shown off one of Hitman: No Subtitle's missions, and it's certainly hitting all the right beats after the previous game, Absolution, rubbed almost everyone up the wrong way. A big sandboxy environment! Lots of NPCs! A revamped disguise system! 'Enforcers' will be able to see through individual disguises, while key figures like heads of security will be able to see through all of them. There's also a kickass font being used for the weapon selection menu. The mission is set at an opulent fashion show, and Agent 47 is there to appreciate some lovely dresses and also to murder a guy. I'm getting serious Blood Money vibes from this, which I suppose is the point. Hitman is out in December, and its release schedule is pretty confusing. However, we're optimistic after what we saw of the game at Gamescom.